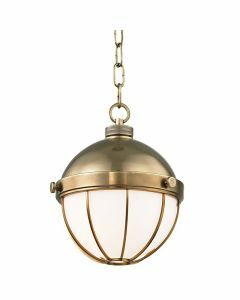 The hanging globe—half opaque white glass diffuser, half metallic shell—is a perennial favorite. The thumbscrews with lathe-cut knurling add to its industrial evocations. 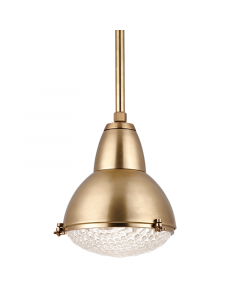 Available in three finishes: Aged Brass, Old Bronze and Polished Nickel. Please select finish from the drop down menu below. It measures 13.5”H x 11.5”Dia. Chain length is 54”. Canopy/Backplate measures 5.5”D. The minimum height is 14.5” and the maximum height is 67.5”. It takes (1) 100 watt max bulb (not included). The socket type is E26 medium base. UL Rating is damp. Shade dimensions: 10.5” top, 5.5” height. The shade has a twist lock attachment. 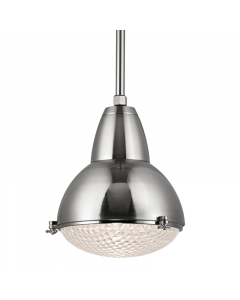 The shade has a glass and metal material with a white and polished nickel color. Ships via UPS. Click on image for greater detail.